Easy to find shoes especially in a large size. That is not easy in other shops. I went into the Harrow Shoezone to buy some shoes for my brother. I picked up a pair of shoes that had no label, but were on a shelf which had a price of £14.99. I picked up the shoe in doubt and went over to a lady who was picking up pins which had been dropped behind the counter. I went over behind and said "Excuse me" and waited and she didnt turn around or respond, i then said excuse me again and still no respond, so i was still waiting, as i did not want to queue up, and then find out the price is higher then what it says on the shelf. I then said "Excuse me" AGAIN for the THIRD time and she turns around and says "I can hear you, i am just picking the pins up" So i said okay sorry why couldnt you turn around when i said excuse me first and say just to give you a minute whilst you pick it up, isnt it customers first and she was saying it is health and safety, and i said it will be if the pins were on the shop floor but not behind the till, and she gave be evil look and turned around. So i said all i wanted to query is the price of the shoe, and she said its what it says on the shelf and carried on with what she was doing. I then queued up, when there was a long queue and this elderly man turned around to me saying she is really rude. There was the cashier - SAMI who scanned the shoe and said it was £19.99, and i said the shelf said £14.99 and instead of apologising and checking he is telling me that i looked at the wrong shelf and then says show me. when i showed him, he knew i was right and went and called his manager, who turned out to be this RUDE WOMAN! They both were looking around on the shelf and SAMI came over saying i will give it for £14.99. So i asked him what was that colleagues name and he said i am unable to disclose the name, and i asked do you guys not have name badges and he said no and refused to give the name. But when he printed out the receipt it had his name on there. In that mean time there was a lady with headscarf who i explained what had happened with the "manager" and she apologised. This manager had red hair and was very rude. I am a deputy manager myself and customers always come first. The fact she heard me say excuse me three times and then turns around telling me she can hear me is unacceptable. I am giving this feedback as i do not want other customers to be treated this way by what so called a manager. please do not publish ok for internal use only ok thanks regards. I would like to make an official complaint. I attended the store yesterday and went to the till to purchase 2 pairs of shoes. I noticed there were signs hanging stating " Sale, buy 1 get 1 half price". I asked the females (x2) present at the till if I could get the offer for my shoes as they were reduced form £9.99 to £7.99. There was a female on a ladder hanging up a sign who intervened and told me in a rude and condescending tone to "Read the sign. It is only sale items". I was taken aback at the aggressive and unhelpful tone especially when she repeated it again. This led to a verbal argument that lasted several minutes which included her suggesting I should take a course in reading! We were shouting between the till and the centre of the store. There were other customers present. I asked to see the manager but she said they don't have one. I asked one of the females at the till what the rude female's name was but she said they were not allowed to tell. I asked if they have a manager but she kept quiet. I asked for the manager's name but again she said she was not allowed to say. The rude member of staff spoke with an accent(possibly Carribbean). I left the store feeling upset at the way I was treated with utter disrespect and disappointed being lied to about no manager and no opportunity to take it further. 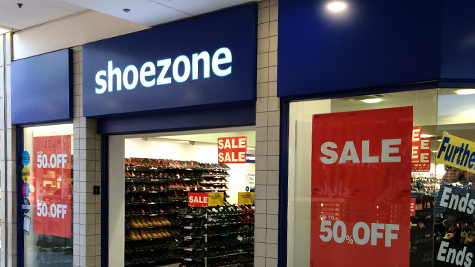 I will not be returning to Shoe Zone because of this experience. It was completely unwarranted and unprovoked. If a customer asks a question they should be dealt with courteously. I have managed staff for over 8 years and had customer contact for over 26 years. This is possibly the worse argument I have encountered in the retail sector.. I hope action is taken to prevent further customers leaving and suggest specific members of staff attend a customer service course and name badges are issued to identify rude and aggressive staff. I am happy to discuss further on the telephone 020 8537 6159 and would like a response to my complaint.